Japanese Episode AG 159: "Fierce Fighting in the Battle Tube! (Satoshi) vs. the Tube Queen Azami!!" American Episode 429: "Queen of the Serpentine!" Satoshi and his friends have arrived at the Battle Tube! While Haruka, Masato, and Takeshi attend to their own errands, Satoshi goes on ahead to challenge the Tube Queen, Azami. However, before long, the woman who was calling herself Azami reveals herself to be Musashi of the Rocket-Dan! 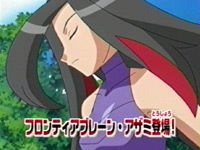 The Rocket trio take off with Pikachu in hand, but they are soon stopped when the real Azami appears with her Habunake. After the Rockets are defeated, Satoshi challenges the real Azami to a Frontier Brain battle. Enishida catches up with our heroes at the Battle Tube and sits with Satoshi's friends while the young trainer chooses his Donphan to face off against Azami's Habunake. As Donphan rolls around the battlefield, Enishida explains that Azami doesn't teach her pokemon any defensive techniques. Instead, she greets her opponents' attacks with attacks of her own and demonstrates this by having her Habunake stand its ground as Donphan uses a Take Down attack. At one point, Habunake engulfs Donphan in a powerful Flamethrower attack, but Satoshi's pokemon charges straight into the attack and knocks out Habunake with a Flamethrower-powered Rollout. Azami's next pokemon choice is Milokaross. Her water pokemon quickly defeats Donphan with a Twister attack, so Satoshi is forced to bring out his Pikachu. Milokaross is able to deflect Pikachu's thunder attacks with its Twister attacks, and before long the stress of using Volt Tackle so many times wears out the little mouse pokemon. As Satoshi's options run out, he orders his Pikachu to jump headfirst into one of Milokaross' Twister attacks. By combining the rotation of the Twister with Pikachu's Volt Tackle, Satoshi is able to raise Pikachu's attack power enough to defeat its opponent in one massive electric attack. Now that both of Azami's pokemon have been defeated, she gives the Luck Symbol to Satoshi. Enishida tells our heroes that their next stop is the Battle Palace near the Futago Islands, so Satoshi and his friends board the ferry to their next adventure! If you've been reading my comparisons for the Battle Frontier, you'll realize that I really don't like the way the anime rushed through these middle Frontier Brains. Luckily, Azami's the last Frontier Brain to get short changed on by the anime producers, so at least we'll be good from here on out. As rushed as it was, this episode did have its moments. Musashi's Azami costume is damn good, and the whole "Azami has a crush on Takeshi" thing ending up being an infatuation with narrow eyes was hilarious. The actual battle itself was good (if not a bit rushed), and there really wasn't anything I'd consider to be a cheap win. The dubbed version continues to replace a lot more of the music than we're used to. While we get to hear four pieces of Japanese music this time around (twice the amount heard in the last episode! ), it's still pathetic considering this is a Frontier battle. Don't Gym Battles and Frontier Brain battles typically have more Japanese music in them? We also get some translation oddities (see below). However, I would like to point out that the name of our heroe's next destination (Metallica Island) is the same in both languages! Didn't expect that one, did you? Throughout the dub of the episode, Barbara insists that everyone addresses the Frontier Brain as "Queen Lucy." In the Japanese version, they all call her anego, which is a humble way of saying "big sister." There are a bunch of other words for "big sister" (oneesan, neesan, etc. ), and this is just another one. The thing about Japanese is that when you have someone you look up to, it's not uncommon to call them "big brother" or "big sister." Doing so doesn't mean that the two of you are actually related; it just means that you have a lot of respect for him or her. I think PUSA was a little confused by this when they had Lucy say "I'm sorry. I hope you'll please forgive my sister." There's nothing in the Japanese version that says that the two are related at all. If I remember correctly, the Robotech dub had the same problem with "Rick Hunter" referring to Roy Focker as his older brother even though the two weren't really related at all. From the point after starts his final attack against Milokaross until the end of the battle, Pokémon Symphonic Medley (the third opening theme to the Advanced Generation series) can be heard playing in the background of the Japanese version. This is replaced by instrumental music in the dub. The TO BE CONTINUED... screen is extended by...TWO seconds!?! ?